I have vacation on the brain right now and I still have a month to go until I am able to go on it. But the reason I am so excited about this vacation is because it's the first trip my best friends are all going on together! We've talked about going on vacation together before but with all of our busy schedules and lives it's never happened! So with vacation on the brain, I'm already thinking about what I'm going to wear! My number one criteria for packing is comfort. Especially now that I have small kids it's important to be comfortable. But don't get me wrong, what girl doesn't want to look cute? I'm sharing my vacation style with you. 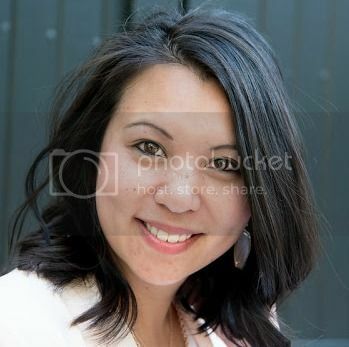 I found these photos off the wonderful Pinterest of course, always a trusty source for outfit inspiration. printed shorts, mixed prints, chambray, fun accessories, hat, and tennies. Perfection! Pleated maxi dress with a fun necklace. 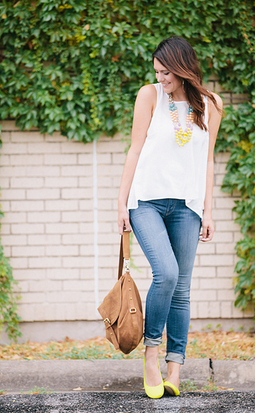 You can't go wrong with denim skinnies, tank top, and colorful flats. And I love this necklace! 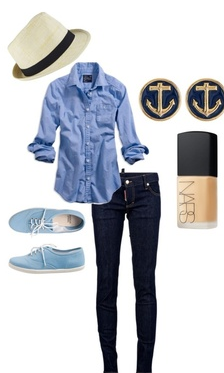 both of these nautical looks are super cute and casual. Leggings are a girl's best friend! I am obsessed with this colorful print! I love the other touches of red in her sunnies, heels, and clutch!